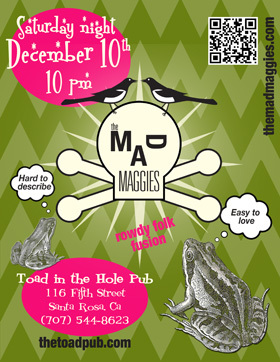 December 10 – Saturday 10pm Toad in the Hole, Santa Rosa. Come for grub, suds and tunes at this popular local pub. 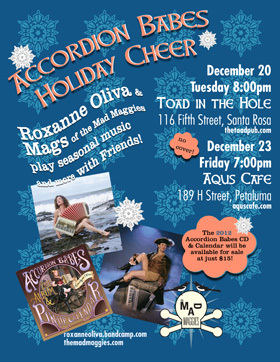 Join Mags, Roxanne Oliva and fellow musicians for some Accordion Babe’s Holiday Cheer. Seasonal tunes plus! 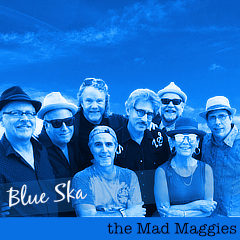 Dan Kahane on fiddle, several Mad Maggies and, well come and see for yourself. We’ll be keeping it lively! • 25% off all of The Mad Maggies Music! Shop our online music store for music downloads (single tracks or full albums in as high quality formats as you prefer) or actual CDs mailed to just about anywhere and get a nice, fat 25% off of everything. Simply use the coupon code crazyholidaze at checkout. Yep, we do love you that much. • Babes and their Squeezes – Sure to Please! 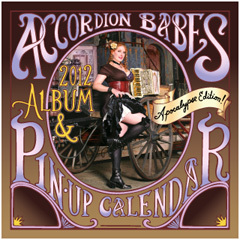 The 2012 Accordion Babes Album and Pin Up Calendar is an ideal gift for accordion lovers, music lovers, pin-up fans and more. 13 images of accordions and their lovely owners PLUS a CD with a track from each of the babes. Mags is Ms. November and “Shake Those Bones” is the track. $15 plus $5 shipping gets one delivered to your doorstep or mailbox or, well wherever. You can pay with credit or debit card at PayPal. accordion babes, accordions, Aqus Cafe, Bandcamp, beer, discount coupon code, live music, Toad in the Hole.